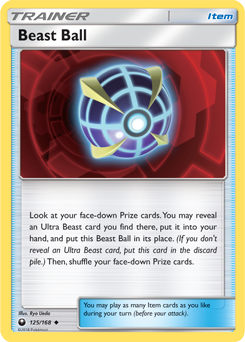 The Prize swap effect of Beast Ball incorrectly counts toward attacks and effects that calculate the number of Prizes taken during the match, such as Salazzle-GX's (BUS #25) Diabolical Claws attack and Iris (PLB #81), and allows you to immediately win the match if your last remaining Prize is an Ultra Beast. Due to the high potential for exploitation, this card has been temporarily banned from play until a fix can be deployed. Fixes for these bugs were included in the 2.55 game update.